Don Marquis was a journalist in New York, apparently minding his own business, when a cockroach and cat invaded his column in the Evening Sun. The pair had been friends in their former lives - archy the cockroach had been a free verse poet and continued to write in his reincarnated state by jumping on a typewriter, which accounts for the lack of capitals and punctuation. Bohemian alley cat mehitabel reflected on her many misadventures, remaining "always a lady in spite of h dash double l." Marquis featured the characters in a hugely popular series of comics and writings beginning in 1916, eventually illustrated by Krazy Kat creator George Herriman. They continued on through the 20s and 30s, staking out a strange territory between comic verse, serious poetry, commentary and cartoon. I was looking around for archy and mehitabel on the internet the other day and I found SpokenVerse, a YouTube channel dating back a few years ago. All of the 400+ videos feature a man's voice reading poetry under the name Tom O'Bedlam. The poems are well chosen, the voice extraordinary. But no one has any idea who did it, or why he did it, or why he stopped. Tom O'Bedlam liked Don Marquis though. 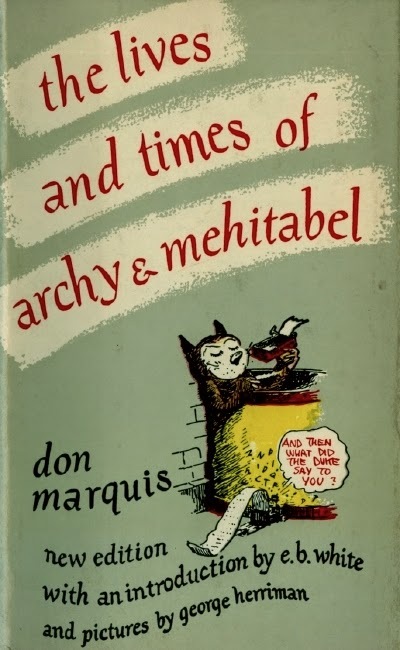 He recorded three of his poems: mehitabel dances with boreas, the lesson of the moth and archy's autobiography (below). If you're a writer who just had to pay their tax bill, you'll probably relate.